I don't wear anything sweatshirt like but I will make an exception this time. 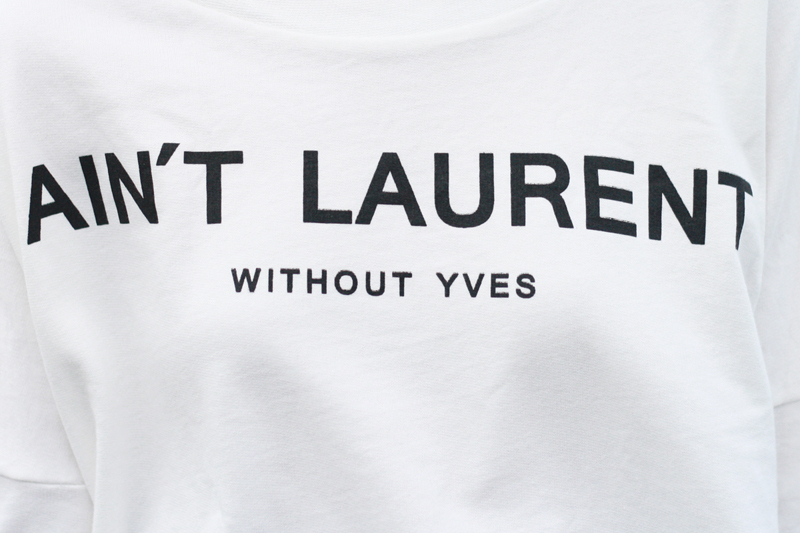 This "Ain't Laurent Without Yves" top definitely wins the best saying on a shirt in my book. There's not much to say, it is what it is. I wore it with an amazing black leather skirt from BB Dakota with asymmetrical zipper detail. I added a splash of pattern to this rather simple outfit with a pair of leopard print loafer flats by Julianne Hough for Sole Society. They are cute, chic, and comfortable. Both the skirt and flats will be my go-to pieces this fall whenever I feel like casual but still put together. Ain't Laurent Without Yves top from GoJane. Sebastian skirt c/o BB Dakota. Janae leopard print loafer flats c/o Sole Society. I'm certain that is the best shirt saying ever. I love how you styled the sweatshirt to still make it look chic! Cute outfit :) It's always nice to have a sweater like this, cuz you can make some interesting looks with it and it's also keeping you warm at the same time (so no suffer for fashion anymore ;) ). Very cute outfit! I love the sweater. You are absolutely stunning by the way! Really want to get this shirt! But have no idea where to get it in Hong Kong! Our sweater looks fantastic on you! Love this quirky sweatshirt! You look so adorable!